Miniature circular bronze medal with laterally-pierced ball suspension; the face with the head and shoulders portrait of King Carlos facing left, circumscribed ‘D. 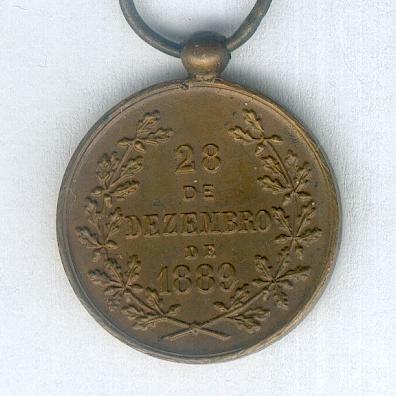 CARLOS I RE DE PORTUGAL’; the reverse inscribed ‘28 / DE / DEZEMBRO / DE / 1889’ within an oak wreath; diameter 17.59mm (0.69 inch); on replaced correct ribbon. 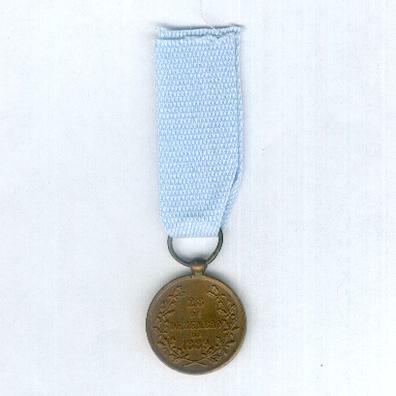 The Medal was issued to mark the Coronation of King Carlos I on 28 December 1889. King Carlos was born on 28 September 1863 and acceded on 19 October 1889 on the death of his father, King Luis I. He was assassinated in Lisbon on 1 February 1908. 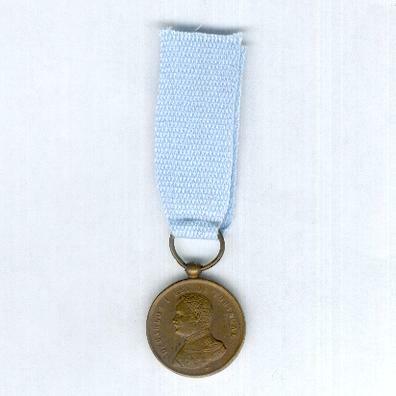 The medal is rare in miniature.